Ever since the temporary downfall of FratMusic.com (once home of the most popular and meticulously crafted playlists), the loyal users who streamed their music from the FratMusic have sought to fill the void by seeking out a site that offers similar playlists. The most important connection FratMusic had with their users is that the playlists were picked by hand and altered according to music genre, giving them a leg up on the computer generated services such as Pandora, iTunes Genius, Last.FM, etc. In fact, FratMusic’s short but overwhelming success and popularity is a prime example of the business term known as “Market Fragmentation”. FratMusic has grown the new emerging market for party playlists and as a result of the demand for their service, an increase in new suppliers have entered in this new fragment of the online music industry. Fratmusic is down, MTV is too busy playing re-runs of Jersey Shore, and Youtube is drowning in ads. What ever happened to good music, new singles, and good old MUSIC VIDEOS? Started by a group of music lovers and DJs, VPlaylist.com is bringing back music videos through instantly streaming video playlists. We scour the internet bringing our viewers not only updated music playlists, but the great videos that go along with them. Whether people are looking to stream videos at parties, keep up to date with newly released videos, or simply looking for a good playlist – we are the place. After the VPlaylist initially reached out to me about the newly launched site, I decided to do my own investigation. The clean and simple UI is easy to use and easy to navigate, and often emphasizes the various sharing tools which will help in the site’s organic word of mouth growth. Also, the playlist genres appeal to almost any mood and are easily accessible. My personal taste is most impressed with the lineup put together on the Mash-Ups & Mixes playlist, although this one does not offer the video component. VPlaylist agreed to do an interview regarding the status of their launch. They are currently moving quickly with hopes of earning a chunk of this niche market. Describe the “a-Ha” moment when you decided to go ahead and build a party playlist site. Why did you decide to include not only music, but music videos? I have always been a huge fan of music videos. I was very disappointed to see all these sites popping up with decent music, but no music videos. They add a story to the music. 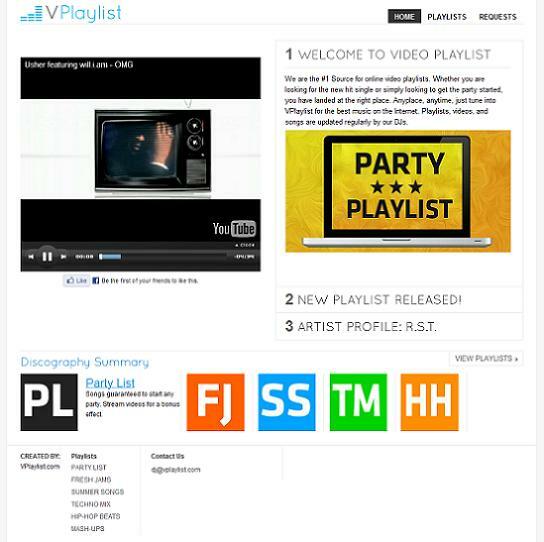 What was the biggest hurdle when building VPlaylist? Quality music and videos. Anyone can have a good site, good idea. But for users its all about the music. We tap into our network of music lovers and DJs for the best songs. How is VPlaylist dealing with licensing and other legal issues that plague the music industry? Our plan is to grow into a legal business that does not pirate music. We have created a business model that will generate revenue to cover the cost of royalties paid to all the music organizations and studios. Why is VPlaylist better than other social music sharing sites such as GrooveShark, Rdio, Last.fm, etc.? Videos, Videos, Videos. But besides that, our product offers great playlists. The problem with Youtube, Grooveshark, Last.fm, is that you often need to know a song to put in on our playlist. Further more, many of the songs suggested are older. We stay ahead with the newest music videos. If its more than 3-4 months old, its too old for us. People just like you. If you think we have a good product, people start sharing. Great! What’s the plan for the future of VPlaylist? To develop a loyal user base that loves the content we provide. Which tracks should we be rockin’ to this summer?